A Cairo court Wednesday pressed life prison sentences against Mohamed Badie, leader of the outlawed Muslim Brotherhood and five other members of the organization, for igniting violence following the removal in 2013 of first democratically elected President Mohamed Morsi. The Cairo Criminal Court indicted Badie, his deputy Khairat el-Shater and the four other members for planning demonstrations and shooting fire in the protests that ensued Morsi’s ouster by the military led by Fattah al-Sisi. The al-Sisi administration has blacklisted the Muslim Brotherhood as a terror group and placed members of the movement on terror list. The Wednesday verdict acquitted former parliamentary speaker Saad al-Katatni and leading members of Essam al-Erian and Mohammed al-Beltagy in the same case. The court’s ruling is subject to appeal. Badie is facing multiple jail sentences. In September, the Supreme Guide and 64 defendants out of 682 other members of the Muslim Brotherhood were sentenced to life over charges of inciting violence in a case dubbed in the media as “El-Idwa Incidents”, Egypt Today reports. 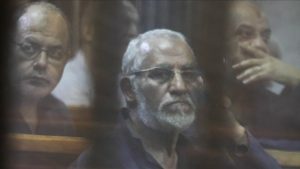 The same month, Mohamed Badie, 75, was handed another life prison sentence alongside 46 other Muslim Brotherhood members in a case known as “al-Bahr al-Azam”, the media notes. Written by: KanelkaTagba on December 6, 2018. Posted by KanelkaTagba on Dec 6 2018. Filed under Headlines, World News. You can follow any responses to this entry through the RSS 2.0. Both comments and pings are currently closed.